Sorry about your crash. I guess you came out mostly ok? 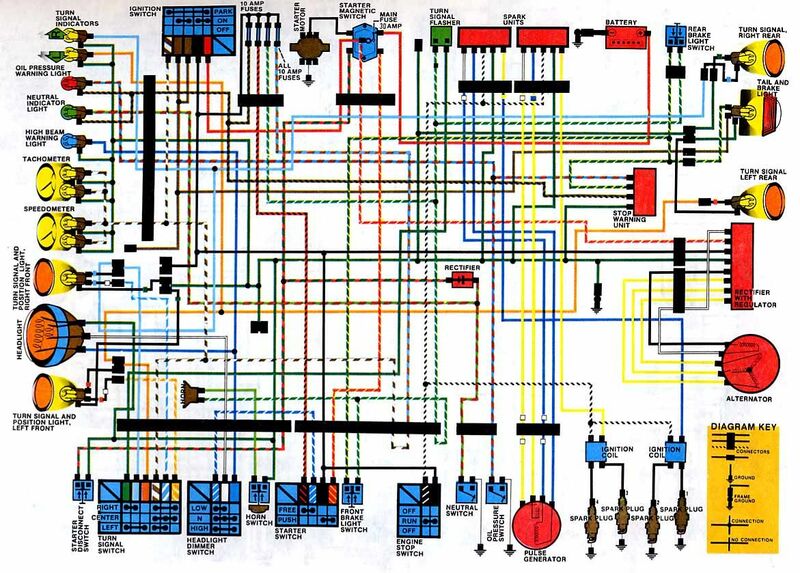 Here is a bare bones wiring diagram. It is for the DOHC Honda's of that era, but it will work on your bike as well. I can say that if you drive a CB 650 without using any electricity exept the ignition you can drive very far without the alternator working. The only problem with not having any electricity is how to start the engine, but as an go cart engine you only need electricity at the pit stops to start the engine. Without the alternator working you still need a small battery to give ignition current. I did see an Yamaha xt 500 once, that had a capacitor instead of a battery, but that I dont know how to install. Masika wrote: no, im pretty sure the alternator/battery powers the igniters as well. Ouch! Sorry to hear that. I've got metal too, throbs like hell when the weather changes. With regards to the electrics.............er! Not from a bike crash. I'm a life long martial artist and I've broken my toes so many times they got arthritic. They put in a plate so the big knuckle of my left toe no longer bends. It feels better now than my right foot--which needs the surgery as well. GeorgeSweety wrote: "Sorry mate, I didn't see you!" Well in those boxes a car is we are practically invisible to them and at a distance the we are suerly somethig a car driver would disregard pretty easy. In many accidents here in Sweden between cars and bikes the driver says he thought it was a moped. As motorcyclists, we need to be more visible. If you look at the diagram above, in the center of the "Universal Key Switch" there is a red and white wire coming from the center of the switch from a point marked "SRT". This is where the starter button would be. You will not find this red and white wire coming from your ignition switch. It comes from the starter button and goes to the starter solenoid. The black wire coming from your key switch goes to the starter button as well. When you push the starter button, it closes the circuit between the black wire coming from the key switch and the red and white wire coming from the starter solenoid. This is what makes the starter motor function. there are 4 wires coming from the solenoid, solid black, solid red, red/white and a yellow/orange. 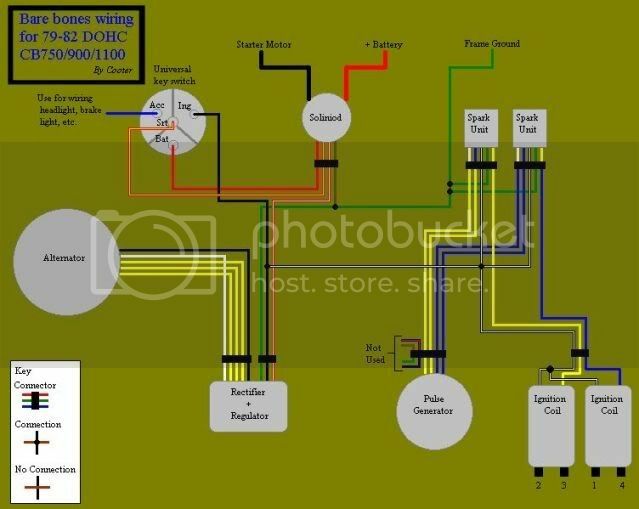 its hard to tell the 2 apart on that diagram but on my bike before anything was taken apart the red/white wire went to the R&R so using that info I sent the yellow/orange to the "switch" which would mean putting a push button between the yellow/orange and the solid black. If not and the red/white needs a switch to the black then where does the yellow/orange go? There should be six wires--if you are counting the solid black the goes to the starter motor and solid red that goes to the battery.